China's Growth Gives Policymakers Pause The U.S. economy is struggling to grow. The European Union is trying to contain a debt crisis. And, in a case of bad timing, the world's fastest-growing major economy, China, is trying to slow down to stem high inflation and what some fear is a housing bubble. 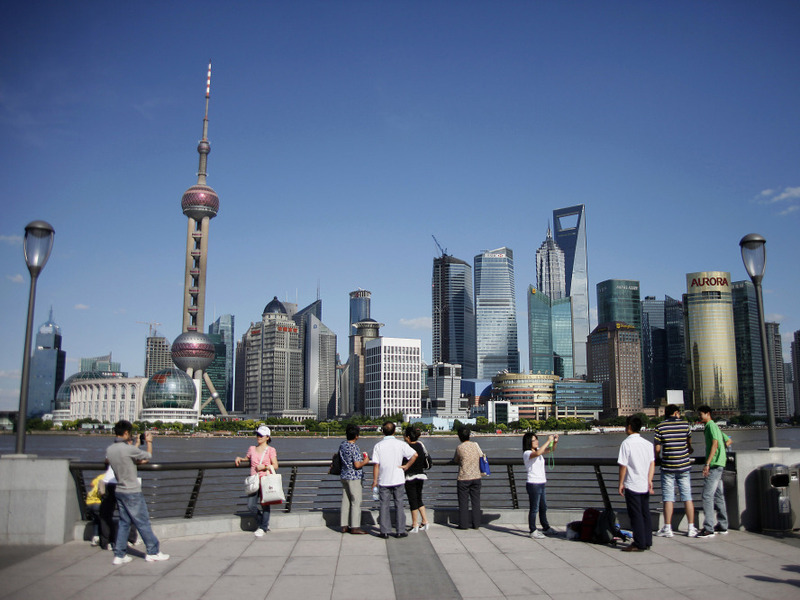 Earlier this year, Shanghai tried to slow down real estate sales by restricting some deals. It's part of a broader Chinese government plan to slow the country's staggering growth. The U.S. economy is struggling to grow. The European Union is trying to contain a debt crisis. And, in a case of bad timing, the world's fastest-growing major economy, China, is trying to slow down. Shanghai has been one of the world's hottest real estate markets, but it's too hot for Chinese officials who are fighting high inflation and what some fear is a housing bubble. Earlier this year, the Shanghai government tried to slow down real estate sales by restricting people from outside the city from buying more than one property. James Ye of Shanghai Pujing Real Estate sits in an office filled with agents hunched over computers. He says the government policy is working; deals for existing homes are bad. "Last year, I sold one property a month," he says. "Now, I sell one property every two or three months." The real estate policy is part of a broader plan by the Chinese government to slow the country's staggering growth. Andy Rothman, who follows China's economy for CLSA, an independent brokerage and investment group, says the Chinese government wants to slow down the economy and improve the quality of what it produces. "Here in Shanghai over the last 10 years, the government has raised the minimum wage by 160 percent," he says. "And this is a deliberate effort to get out of the business of focusing on low-value-added shoes and toys and move more upmarket for better quality jobs that pay better." Rothman says he expects China's economic growth to fall below 9 percent next year — the slowest rate in a decade, but still fast by global standards. "Strong growth is China will put a floor under the global slowdown, but it's not going to save the world," he says. One reason: Most Chinese just don't have the purchasing power. "Chinese consumers are spending a lot. Retail sales growth is 17 percent," Rothman says. "But the Chinese consumer doesn't have enough money to make up for American consumers not going shopping." Chinese consumers are spending a lot. Retail sales growth is 17 percent. But the Chinese consumer doesn't have enough money to make up for American consumers not going shopping. Rothman has a point. China is getting wealthier, but most Chinese still don't have that much money. Xiao Yandong makes a living standing in Shanghai's financial district selling pancakes each morning for about 50 cents each. He makes 200 Chinese breakfast pancakes a day, seven days a week. He earns just $500 a month. Xiao doesn't have much disposable income. He hasn't taken his wife and 8-year-old daughter out to eat all year. "We buy groceries to cook at home, because eating out is too expensive," he says. "Each meal out costs between $40 and $50, and then it's gone. So, we take the subway to friend's house to eat dinner." Whitney Wang, an English teacher, strolls by on her way to work. She earns more than three times what Xiao does, but she's saving most of it for an apartment. That leaves little to spend on Shanghai's pricey merchandise. "Jewelry's something I haven't buy for a long time," she says. During the global slowdown in 2008, the Chinese government spent billions of dollars on roads and bridges to prop up growth. This time, another dose of government stimulus spending seems less likely — unless demand for Chinese exports from Europe and the U.S. plummets. "If millions of migrant workers who are in factories, especially in southern China, making iPads and microwave ovens and DVD players lose their jobs, then you'll see a few quarters of stimulus to find temporary jobs for those folks," says Rothman of CLSA. The U.S. and Chinese economies remain highly interdependent, but China faces its own unique challenges: Its leaders are certain to focus on the risks to their economy before addressing the problems facing the U.S. and the EU.